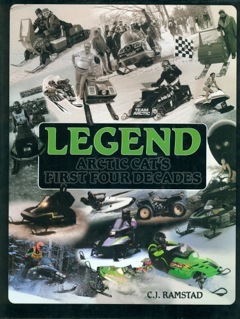 Legend - Arctic Cat's First Four Decades - Midwest Sports Publishing Network, Inc.
BACK IN PRINT AS OF MAY 2006! The bestselling snowmobile book of all time is back in print after being unavailable for more than a year. Some copies of the original printing in 1989 are selling on Amazon for over $1000! Luminously written and profusely illustrated with over 300 photographs, this is the story of the red Arctic Cats of the 1960s, the Black Panthers and EXTs that defined the 1970s, the trials of the market collapse of the early 1980s and the triumphant emergence of a pioneer returning to dominance once again with the new Panthers, Panteras and ZRs of the 1990s to further define the nature of wintertime motorized recreation worldwide.